The past ten days have shown that Ireland's Prime Minister is not really up to the job of leading the country through the current crisis. Kenny might have been fine as Prime Minister, or Taoiseach, in less turbulent times, but unfortunately for him Ireland is being tossed about in a perfect storm of national economic calamity and tremendous uncertainty surrounding the European Union and the euro. Kenny gives the impression of having memorized his copy of "How to be Prime Minister for Dummies," but he's demonstrated no instinct for real leadership. He knows he needs to act Prime Ministerial, but does so at the wrong time and goes to ground when the country really needs to be reassured that it's being properly led. Two weeks ago Kenny announced to great fanfare that he was going to address the nation, live on national television. Initially one of the two national networks balked at preempting their normal Sunday night programming – the X Factor – and announced instead that they would air Kenny's speech on Monday night. Pressure was brought to bear, however, and they agreed to show Kenny's speech on Sunday night, albeit on a delay of half an hour or so. The news media were all of aflutter. After all it had been 30 years since the last such "State of the Nation" speech. What would he say? We all knew Ireland is in dire straits economically and financially - was there something about this Kenny needed to address? We also knew the government was due to announce its budget for 2012 the following Monday and Tuesday – perhaps he was going to deliver a bombshell headline item from the budget? And then there is the EU and the euro. By that weekend there were all sorts of rumors about what might happen with the euro and the EU and what might be the outcome of the crunch EU leaders' summit the following Friday. I convinced myself that Kenny was going to say something big on this topic. 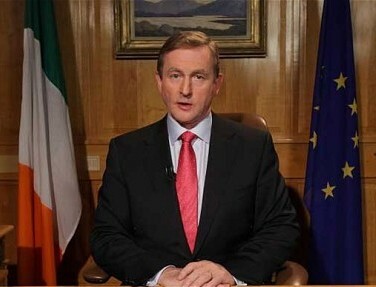 Enda Kenny's 'State of the Nation' address - more than words? In the end Kenny said nothing. Nothing new, anyway. The speech was an utter flop. Kenny gave us was nothing more than a summary of what had been in every news bulletin and in every newspaper for weeks. The government 'must cut spending and raise taxes' was the gist of it and there's “uncertainty” surrounding the euro. Oh, and the economic disaster is "not your fault." Gee, thanks. Fast forward a few days to the EU leaders' summit. Everyone in Ireland knows the score. We all know that (a) Ireland is one of the smallest members of the EU and (b) our position is made even weaker by the fact we had to be bailed out. We're in a tough spot. We didn't expect Kenny to work any miracles in Brussels. However the summit was a disaster for Ireland, although there was little Kenny or any Irish person could have done to stave off this disaster. The summit was a disaster because Ireland, as a eurozone nation, is compelled to join the EU's new fiscal union yet our primary trading partner, Britain, rejected the Franco-German deal and will not cede any fiscal controls. We'll be competing with Britain with one hand tied behind our back by the Germans and French. When it comes to EU affairs, Ireland is generally pretty tight with Britain, but Britain now stands at a great remove from the center of EU decision-making. We'll be largely on our own in the EU. The summit was also a disaster for Ireland because (a) EU leaders didn't come up with a credible plan to end the uncertainty about the euro and (b) Ireland may have to impose a new financial transactions tax that could drive tens of thousands of jobs out of Ireland to Britain, which won't be imposing the tax. There's that competition thing again. Things are very bad now, but thanks to last week's summit they could get a heckuva lot worse. If there was a moment when the nation needed to hear from Kenny this was it. He should have addressed the nation this past Sunday on what happened at the summit, what it all means for us and what he plans to do now. Yet we've heard very little. On Friday evening we heard Kenny say that he had told the summit that we are going to "pay back every cent" of Ireland's massive bank debts - even though it's "not your fault" we owe all that money - and that he had "placed that firmly on the table" that we have gone through "exceptional difficulty" borrowing to pay back all those banks debts. That'll show 'em. He also said the Attorney General will determine whether we need a referendum on the EU deal, but even that we won't know for months. He has said nothing to allay anyone's concerns or clarify what the government's position is with regards to all those financial services jobs that now may be at risk. He's insisted that Ireland's "economic security has been defended and protected," although there's no evidence that any of that is true - whatever it means - and he's offered nothing to back that up. Ireland's situation is serious and it looks like it may get a lot worse. Thanks to the proposed fiscal union we won't have the flexibility to adopt the type of policies that worked during the late 80s and 90s to get Ireland out of the last recession. Ireland needs its leaders, especially the Taoiseach, to rise to the occasion. Grandstanding and placing things "firmly on the table" is not going to cut it. Kenny needs to show that he's out front on these matters. He needs to explain what we may have to accept and what we will not accept. He needs to lead.